Vastex International has introduced a new LittleRed X3D-54 multi-function dryer with 137 cm wide conveyor belt capable of curing over 720 plastisol-printed garments per hour, 240+ water-based or discharge-printed garments per hour, and 100+ garments per hour per chamber inkjet-printed with digital white ink. The new dryer features a high-powered pre-heating zone that boosts ink temperatures past 149°C within the first few centimetres of conveyor travel, maximising the dwell time garments are exposed to optimum digitally-controlled curing temperatures. By shortening the pre-heat time, the X3D allows inkjet-printed garments and pretreated garments, as well as garments pretreated and printed in one process, to cure at the optimum temperature and dwell time without constant monitoring. The dryer’s three 122 cm wide heaters are digitally-controlled and height-adjustable to maximise curing efficiency for bulky or over-sized garments. The X3D also offers precision-thermal-profiling (PTP) to match curing conditions to the drying characteristics of each ink type, particularly difficult-to-cure inkjet-printed white ink. The multi-purpose dryer is 224 cm long, 105 cm wide and 127 cm high, and features a 15.6 cubic metres/minute targeted exhaust system as standard to rapidly remove moisture and air contaminates from the heating chamber, keeping the exterior surfaces and controls cool. 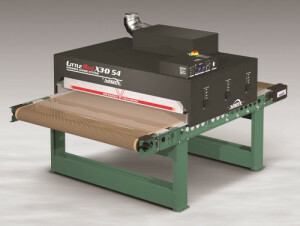 The conveyor belt is continuously centred by a roller belt tracking system, and driven at precisely controlled speeds to vary dwell time in single-chamber units from 30 seconds to four minutes, and up to eight minutes in dual chamber models, which are particularly suited for Kornit DTG printers and high capacity screen printers. The capacity of all LittleRed dryers can be increased by adding heating chambers, extending the conveyor belt length and increasing the infinitely-variable speed setting of the digital belt control.